So-called "adolescent films" first gained widespread popularity in Korea during the 1960s, and of these, Kim Ki-deok's Barefooted Youth is the best known. Doo-soo lives in a poor neighborhood and makes his living doing odd jobs for a local gang. One day he comes across some thugs harassing two young women, and he intervenes, saving the women but getting himself injured in the process. Later when one of the women, an ambassador's daughter named Johanna, comes to thank him in person, the two strike up a friendship that will eventually lead them into trouble. The Seoul Sinmun reported November 13 on budget cuts to native-speaking teachers in public schools in an article titled "[Controversy over welfare] Because of daycare, native speaking teachers are saying 'Oh my God!'" The article opens by asserting that, "One local government after another is expanding the budget for free day care programs and reducing native speaking instructors." According to the budget submitted by the Incheon Office of Education to the Incheon City Government, this year's native speaking teacher budget will be cut from 14,494,000,000 won to 9,076,000,000 won, a reduction of 5,418,000,000 won. There are currently 202 native speaking teachers (180 English teachers and 22 Chinese teachers), and these will be reduced by 76 to 126 teachers next year. The Daegu Office of Education will reduce its budget by 8.8 billion won, reducing its teachers from 443 this year to 323 next year. The Chungcheongnam-do Office of Education will reduce its current 438 teachers by 71 to 367, cutting 42 from elementary schools, 13 from middle schools and 16 from high schools. The Chungcheongbuk-do Office of Education will cut Local Education Subsidies and cut 113 out of 306 native speaking teachers. To make up for this video lessons will be increased and teachers will travel from school to school. Offices of education are saying that native speaking budgets are getting the most cuts since there is less urgent need for native speakers compared to day care, but parents are complaining, saying that both are important. Incheon's placement rate for foreign teachers is already only 55%, compared to the national average of 81.4% of schools, and the placement rate will only drop. As well, TBC reports that for next year Daegu has cut the native speaking teacher budget in half, from 18.2 billion won this year. Above, in the Seoul Sinmun article, we see 8.8 billion won has been cut, which accords with 'half the budget' being cut, though it's odd that only 120 out of 443 teachers will be cut. While the Seoul Metropolitan Office of Education isn't talking too openly about it, there may be cuts in Seoul as well. Offers to renew contracts were delayed two weeks until mid-November, though it seems teachers currently working should be able to keep their jobs. Below is a chart from the Kyunghyang Sinmun showing public middle schools in Seoul with native speaking teachers. While SMOE has cut funding to NSETs for middle schools, the district offices can use their own budgets to pay NSETs. 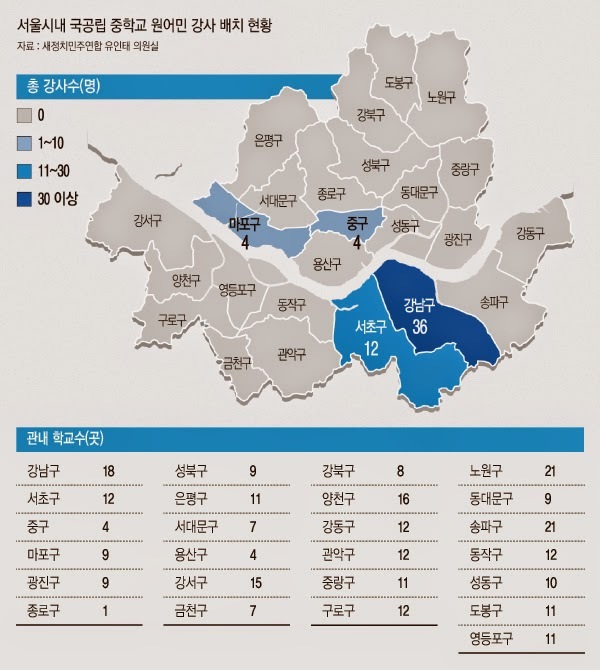 Most don't have the resources, but Gangnam and Seocho districts have a 100% NSET placement rate in their public middle schools, while most districts have no teachers at all, leading to fears of this contributing to the gaps between rich and poor neighbourhoods. One thing worth noting is that while it's often said that Korean teachers will replace NSETs, it seems hiring Korean English language instructors may also fall by the wayside. A friend of mine in this teaching position in Gangseo-gu in Seoul is about to lose his job due to budget cuts. According to the Gukje Sinmun, in Busan, the budget has gradually shrunk from 17.6 billion won in 2011, to 13.7 billion won in 2012, to 16.2 billion won in 2013, to 12.4 billion won in 2014, to 6.9 billion won for 2015. The number of native speaking teachers during that time has gradually shrunk from 522 in 2011, to 528 in 2012, to 399 in 2013, to 304 in 2014, to 170 for 2015. The teachers taught at all levels of public school until 2014, after which only elementary school teachers remained. As of next year, teachers at small schools will travel and teach at several elementary schools. As reported by Yonhap back in late October, Saenuri Representative Yun Jae-ok pointed out then that the native speaking teacher placement rate in schools nationwide has decreased from 81.9% in 2012 to 65.1% in 2014. According to Rep. Yun, in 2012 there were native speaking teachers placed at 9,315 schools out of a total of 11,368 schools nationwide, making for a placement rate of 81.9%, and this fell to 81.4% in 2013 and 65.1% in 2014. As well, the number of students of per native speaking teacher has increased. In 2012 there were 8,529 NSETs teaching 6,807,637 students nationwide, making for one NSET per 799 students. In 2013 this increased to one NSET per 821.1 students, and in 2014 this increased to one NSET per 947.2 students. In looking at the history of the EPIK program before, I posted this chart made in 2010 by the Seoul Sinmun showing the number of native speaking teachers placed in public schools between 1995 and 2010, which reveals the hit the program took in 1997 after the financial crisis (it took 7 years to recover the numbers it had then). 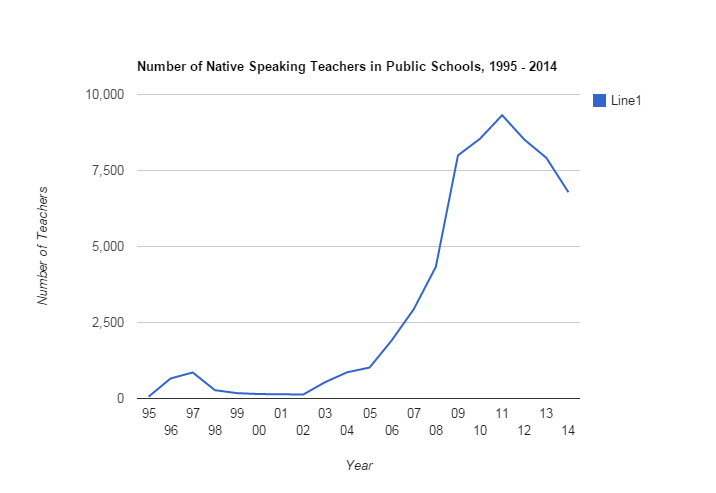 That graph is a bit compressed, height-wise, however, so I made a new one using data from this Korea Observer article which notes that 2,500 native speaking teachers have been cut over the past three years, dropping to 6,785 as of April this year from the high point of 9,320 in 2011. The number of native speaking teachers in Korean public schools made an incredible jump between 2005 and 2009, from 1,017 to 7,997 before making a smaller increase to 9,320 over the next two years and has seen, as the Korea Observer reported, a decrease of around 2,500 teachers since 2011. Adding up the cuts announced above, at least another 500 teachers will be cut next year. To finish with a bit of happier news, the Yeongnam Ilbo reported on November 17 that foreign teachers in Daegu had organized a give a gift appeal for children in childcare facilities called Daegu's Time to Give, which has also been reported on by the Korea Herald, and can be found on Facebook here.